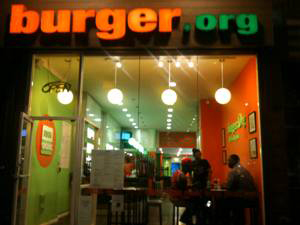 When I tried "Burger.org" (website is actually Burgerorg.com) last year at their original location in Philly a few months after they opened, I was not impressed. They also had a location nearby called "Chicken.org". Unsure if that still exists. But perhaps they've turned things around. Since last summer, they've opened 3 additional locations, one on Chestnut Street in Philly (which when I popped in on July 5th at ~6:30pm, was packed, although it was a smaller location), one in Cherry Hill, NJ, and one in Margate, NJ (near Atlantic City). I need to assume that the place is popular, otherwise they would not expand so quickly (although, you know what happens when you assume). Now, I'm learning, Burger.org is expanding into the Philly suburbs of Elkins Park, replacing the formerly popular Max & David's which closed after Pesach this year. Additionally, the restaurant's owners are seeking to expand to the Main Line (Bala Cynwyd, PA area) as well as possibly Washington, D.C. However, after reading some reviews on Yelp of their Margate location, I'm seeing many people having the same experience that I had at the Philly location last year, which wasn't positive. I'm curious to see how this chain will be able to sustain rapid growth amid tepid reviews. I understand that they are opening locations in areas that don't have that many Kosher options, but still, savvy Kosher eaters will quickly find other options. (Should the management of the restaurant need professional advice, feel free to contact me). I do want to see Kosher establishments succeed, but I also will call out poor food & service when I see it. I wish them much success. Below is a map of the 4 existing Burger.org locations, plus the new location opening this fall in Elkins Park.